Hello faithful readers!! I have added a new tab to the right hand side of my blog that enables you or anyone to donate to the Children’s Miracle Network. If you don’t know my family’s story already let me fill you in. My daughter Hayley was born on February 4, 2010. She was born at a gestation of 25 weeks and 5 days, normal pregnancy’s last 40 weeks which means she was 14 weeks and 2 days or over 3 months premature. When she was born she weighed 1 pound 11 and a half ounces (775 grams). She was put on a ventilator, given intravenous nourishment and medications and was placed in an incubator. This is a link to a slide show I made about her journey home. In total she spent 93 days in the Neonatal Intensive Care Unit. We were able to bring her home on May 9th, 2010 which was Mothers Day, a very fitting day as Lyndsey had spent every one of those 93 days with Hayley in the hospital. Hayley is truly a miracle, her original due date was May 15th, she actually came home earlier than expected. She is now almost 7 months old and is growing and progressing just like a full term baby. Unfortunately not everyone is as lucky as we have been, most baby’s born in the same timeline as Hayley end up with severe respiratory conditions, infections, brain damage, Cerebral Palsy along with many other complications. The Children’s Miracle Network provides additional funding to NICU’s and Children’s Hospitals all over Canada and the United States. Without their funding children like Hayley would not have access to state of the art equipment and specially trained staff and without them my daughter would not be here today. I know that charities bombard people on a regular basis with all the reasons that they should donate to that particular one and they all have a point, but children are different. Children have no voice, they can’t tell us what’s wrong and they shouldn’t have to suffer. They are kids who should get to learn to laugh, walk, talk, play, love and most of all live. The left hand picture is Hayley when she was born, the right is her now. Please give other kids the chance that Hayley had, the chance to live. All it takes is a click and some compassion. Tuesday August 17th, 2010 is a day that I will remember for the rest of my life. Not in any way associated to food, instead it was all about music, stories and looking back on life through the eyes of an amazing song writer. Originally I had planned on writing about The Speakeasy on Granville street where I had been previously and had some great food. This time however it didn’t live up to the memories I had. That’s all I will say as I still really enjoy The Speakeasy and may revisit it soon for a “second chance”. Fran Healy, for those of you who may not know, is the lead singer and songwriter for the Scottish band Travis. Travis rose to fame in the mid to late 90’s alongside other UK bands like Oasis, Blur and Radiohead with hits like Why Does It Always Rain On Me and Writing To Reach You from their second studio album titled The Man Who. Their music was a big part of my life back then and helped me through some tough times, as it does to this day. I have seen Travis 3 times in Vancouver so when I heard Fran Healy was doing a solo tour I knew I had to be there. It was the first time Lyndsey and I had been out, just the two of us, since we brought our daughter home from the hospital. We walked across the street to the Vogue Theater after finishing our drinks and got in line for the show. The Vogue is an old theater with traditional seating but for this show it was general admission and we grabbed 2 seats about 6 rows back right in the center aisle, very nice. When Fran came on stage the first song he performed was 20, a song about growing up and leaving your teen years to become an adult. He performed it without a microphone or amp, just his guitar and his voice, it was stunningly good. He asked the crowd if they liked it which they did and he proceeded to play the entire 2 hour set that way. How many artists that have sold millions of albums can you go see in an intimate setting like that? Not many. He played a lot of Travis songs and told a story about how almost every song was written. Where he was, what he was doing, who he was with. What an amazing story-teller. He also played a lot of new songs from his new solo album, Wreckorder. The new songs sounded great and I can’t wait for October when the new album will be released. There’s one song on the album that has Paul McCartney (PAUL MCCARTNEY!!!!!) playing bass, the actual bass he played for most of the Beatles records. There’s a duet with Neko Case from the New Pornographers that he played solo for us. All told this was the best live show I’ve ever seen, period. The best part of the show was actually after Fran had finished playing. He stayed on stage and signed things for anyone who had something to sign. Lyndsey and I went up with a tour poster I had “borrowed” from the mens room earlier….we told him about Hayley and how his music had helped get us through 3 months in the hospital with her. He asked a few questions about how she was doing and really seemed touched that his music had been a source of strength for us. He signed the poster for Hayley and we both shook his hand and headed for home. As we walked down the alley behind the Vogue to where we were parked we were both in shock. Had this really happened? What a great night. I was talking to a friend of mine recently who writes a music blog called More Than A Feeling (the link is on my home page). We were talking about what makes “good” music. Everyone’s idea of what makes music good is very different but it usually comes down to what they were listening to at important or meaningful moments in their life. For me the music of Fran Healy finds itself firmly entrenched in almost every major event of my adult life. From divorce to finding new love, the birth of my daughter and the stress of her being in the NICU for 3 months. Music is a powerful tool. I hope that somehow he gets a chance to read this some day. I’m sure I’m not the only one who believes in the power of music, actually I know I’m not. Thank you Fran for a wonderful show, an unforgettable night and most of all for writing the soundtrack to my family’s journey. Rogue Kitchen & Wetbar is located at Waterfront Station in historic Gastown. Built in 1910 Waterfront Station was originally used as Canadian Pacific Railway’s terminus station for its transcontinental passenger line and is a beautiful example of neoclassical architecture. As you enter Rogue you immediately notice the scale of the room, this place is gigantic! Vaulted ceilings, giant chandeliers, towering window treatments all done in a way that blends modern design and old world cool together seamlessly. Visually this is one of the coolest spots in town. 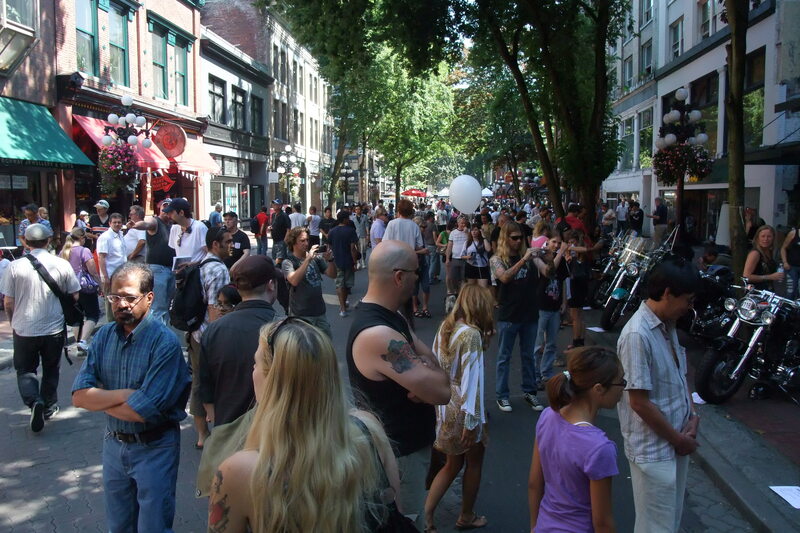 My trip to Gastown was actually for the annual motorcycle show & shine which was great but ultimately too hot to avoid seeking out cold beer for relief. Rogue seemed a good choice as their beer selection is fairly large with a great assortment of REAL beer on tap. When I say real beer I mean beer that doesn’t come from a factory producing thousands of gallons of beer a day. I had the Crannog Bog Trotter Brown Ale (great name! ), the Crannog Backhand of God Stout (another great name!) and the Howe Sound Honey Pale Ale, all of which were fantastic. The first thing that I saw on the menu that really jumped off the page was something called Fries x 3. 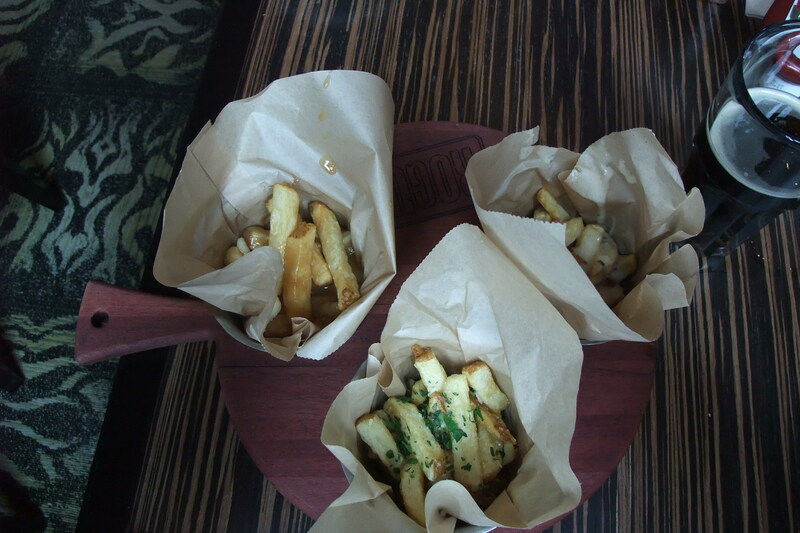 Hand cut Kennebec fries done 3 different ways, poutine (gravy and cheese curd, for my American friends) in one dish, Gorgonzola cream and bacon in another and Parmesan with truffle oil and basil in the last dish. They were all excellent but the Gorgonzola cream and bacon was ridiculously good. The Truffle oil was almost undetectable in the third dish, which was disappointing because truffle oil is mouth-wateringly good, but they were good none the less. My co-pilot for the motorcycle show, Al, who is known more commonly as Bert even though his name is Allen…ordered the Rogue Burger with fries. It looked good and Bert confirmed my visual assessment. He said it actually tasted like good quality beef as opposed to most other burgers where the beef serves as texture more than flavor, at least I think that’s how he put it. 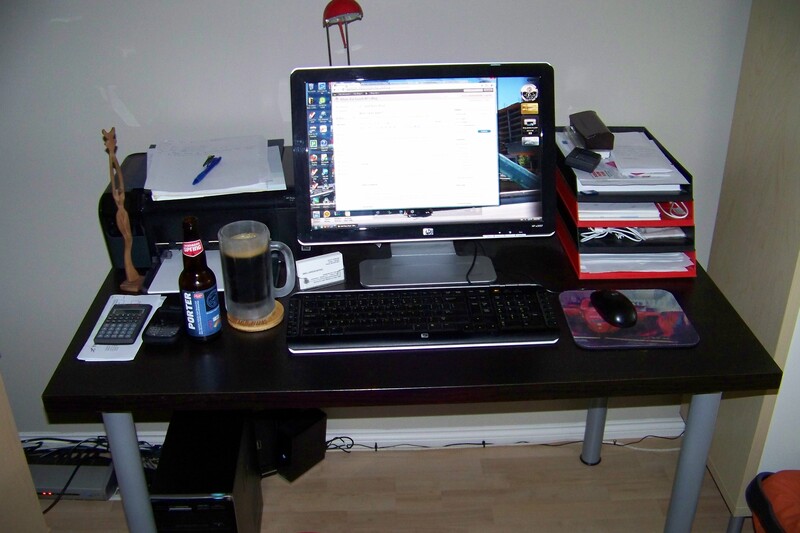 Did I mention that the beer was really good? 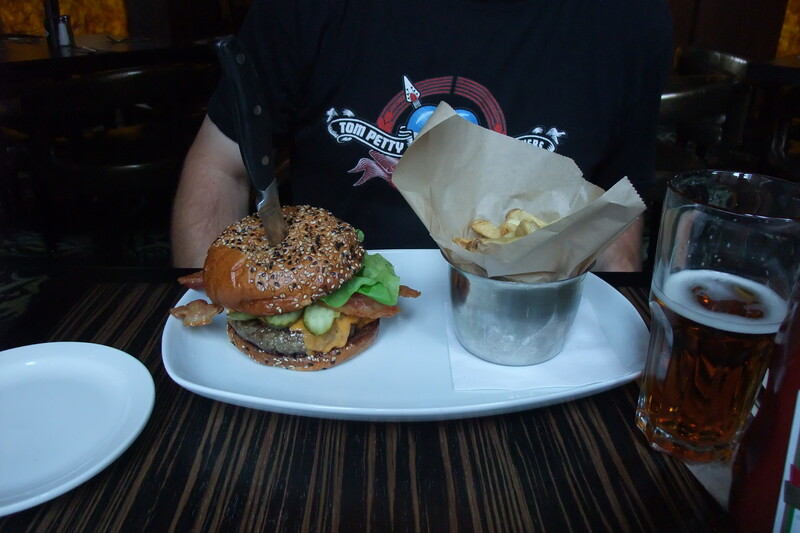 The presentation was dramatic with a large steak knife stabbed through the center of the burger holding it together. This burger is 9.2 ounces of house ground sirloin, manly. I, once again, had a strong craving for pizza and was helped along by the waitress who informed me they were half price on Sundays. I ordered the Pepperoni & Three Mushroom Pizza with roasted garlic and mozzarella. 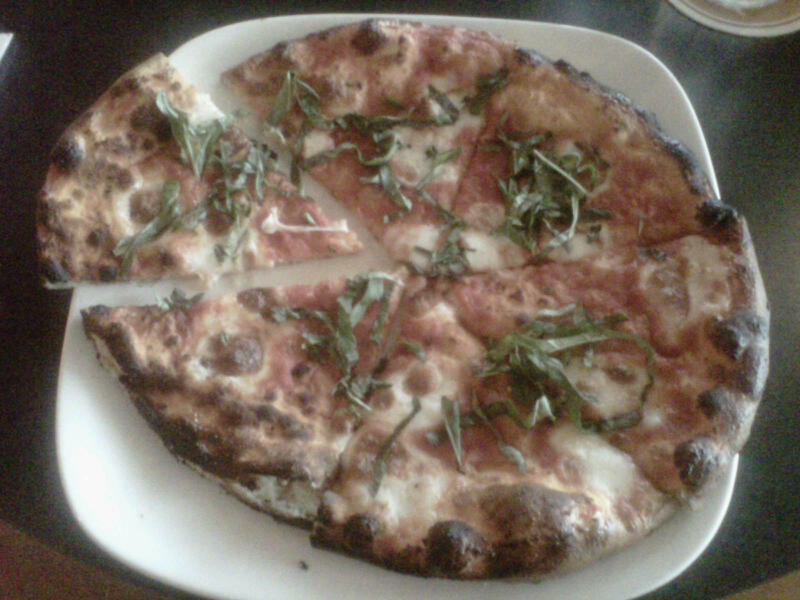 The pizza was fantastic with a thin and crispy crust, whole cloves of roasted garlic and a “mushroom medley”. 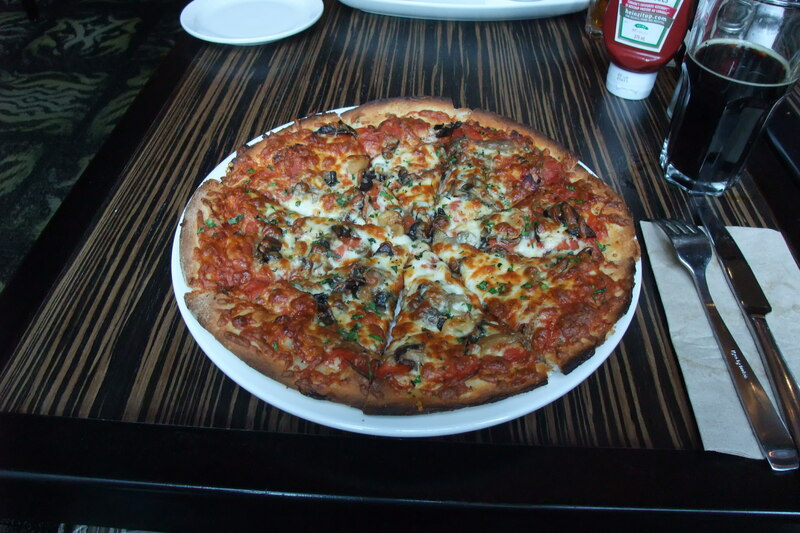 I’m not sure what the three mushroom varieties were, and the menu wasn’t much help but I am guessing they weren’t “magic” because I remember paying the bill…They were a nice compliment to the pizza though, even with the mystery surrounding them. Now here’s the weirdest part about Rogue Kitchen & Wetbar. Their menu has a “pay what you think it’s worth” caveat. If you don’t like what you’ve ordered as much as you thought you would you can pay less for it, or if it’s better than expected you can choose to pay more for it. This part of the process seems a little out there to me and it wasn’t made very apparent by our server. When our bills arrived she asked us “does that look ok to you?” Had I not know about the payment philosophy before hand I wouldn’t have had a clue that she was referring to the prices of our food and I suspect most other customers wouldn’t either. I have no problem paying the listed price for something I order or else I wouldn’t order it and if I am dissatisfied enough to complain about something I would hope the restaurant would do something about it instead of leaving me the option of adjusting the price myself. The confusing payment system aside Rogue Kitchen & Wetbar is somewhere I will definitely be returning to. The food was great, as was the service. The room itself is incredible and the prices are very reasonable, especially for this part of town. Another great food find in our city, go out and enjoy this hot summer weather and some great local food! For many people who live in the city the local pub is a place you can go and feel at home. Lots of local pubs are within walking distance which makes for a safe place to have a few drinks without having to worry about how you’re getting home. If you’re a regular the staff probably know what you order and may even know you by name. The most interesting thing about local pubs, to me, is how willing to forgive and forget we are when you receive poor service or when the food isn’t great. My local pub has all the things I talked about that make it a personal comfort zone for me. The funny thing is that the food really isn’t great yet I continue to go there on a regular basis. As someone who writes about food and can be very critical at times it seems strange that I would let this slide. Last summer I spent a day in Whistler with my parents and my Aunt and Uncle from Edmonton. We had lunch on a patio in the Village and it was pretty good, as the food tends to be in most of Whistler. On the way home my uncle convinced me that we should go to a pub for some food and drinks that night as they were going home the next day. My local pub was chosen and I met them there later that evening. When the food we had ordered arrived it certainly didn’t win any awards, in fact my dad sent his french onion soup back 3 times because it was cold. Personally I don’t know if french onion soup is something I would order at a pub, it’s always good to stick to the standards, chicken wings, nachos, clubhouse sandwich, the triple crown of pub food. Stray too for from that and you’re in dangerous waters, unless you know that a particular pub has a good menu and/or chef. I know that chicken wings area safe bet at my pub and strongly urged the rest of the group to try them, while at the same time trying to steer them away from other menu items that I knew were risky. I was not successful. I think the reason I don’t mind the average food at my local pub is that my connection is deeper than just food and drink. There’s a feeling of belonging somewhere and that goes a long way towards making up for its other shortcomings. Support your local pub because someday you may need them to support you, not that I advocate drinking as a cure to all your troubles. Sometimes it just feels good to belong. The City I Love and a Recipe! Every once in a while in my current job I am given the opportunity to soak in some great views from the top of Vancouver’s high rises. Even more rare is the chance to see these sites at night, when the city is at its most beautiful. This week is one of those rare occasions. I’m not saying that I enjoy working at night but it does have its benefits. Take a look. Truly beautiful, I love Coal Harbour. Now let’s try something new, it’s recipe time!! Today’s recipe is Creamy Cajun Chicken Linguine, be forewarned, this isn’t health food. I like to make this on a rainy day or when it’s cold out, the heat is a little much for a hot day but you can adjust that to your own taste. Toss chicken and seasoning in a mixing bowl until chicken is coated. In a large pan, preferably a deep frying pan, add the butter and sauté chicken over medium high heat until tender, about 5-7 minutes. Reduce heat and add green onions, sun-dried tomatoes, salt, pepper and heavy cream. Let simmer until cream starts to thicken and it is heated through. Add to pasta and toss with Parmesan cheese. Serve and enjoy! If you like more heat you can add chili powder to the Cajun seasoning, and for the truly adventurous you can add chorizo sausage or shrimp or both. Hope you like it, it’s kind of a Louisiana twist on an Alfredo sauce. Not sure where I found this recipe but it’s awesome. The Vancouver street food scene has been a sad, repetitive song played over and over for years. The Lyrics were all about hot dogs in the summer and chestnuts in the winter, boring (even if the hot dogs have Japanese fixins’ ). 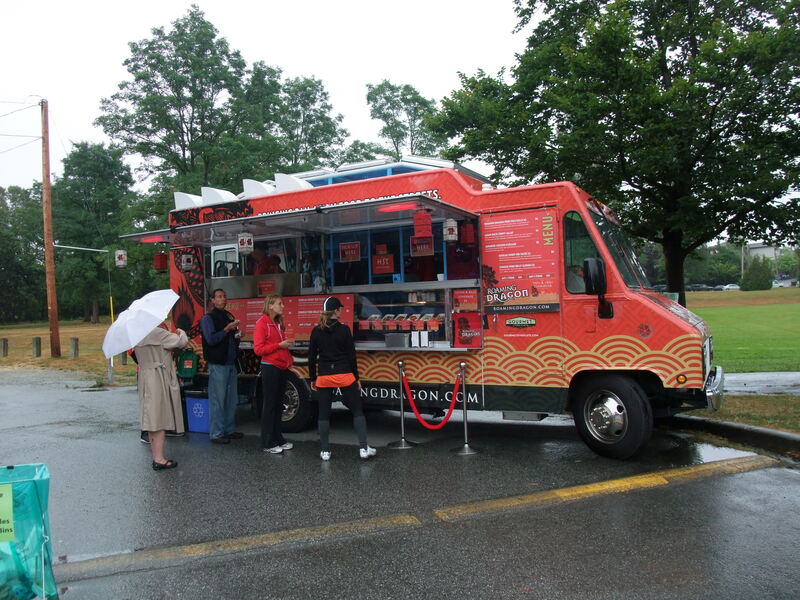 Thankfully those days appear to be over with the City of Vancouver’s new policy on food trucks. Food trucks have been a big part of other cities culinary scene for years with colorful trucks rolling all over town with everything from taco’s in LA to fine French food in NYC. 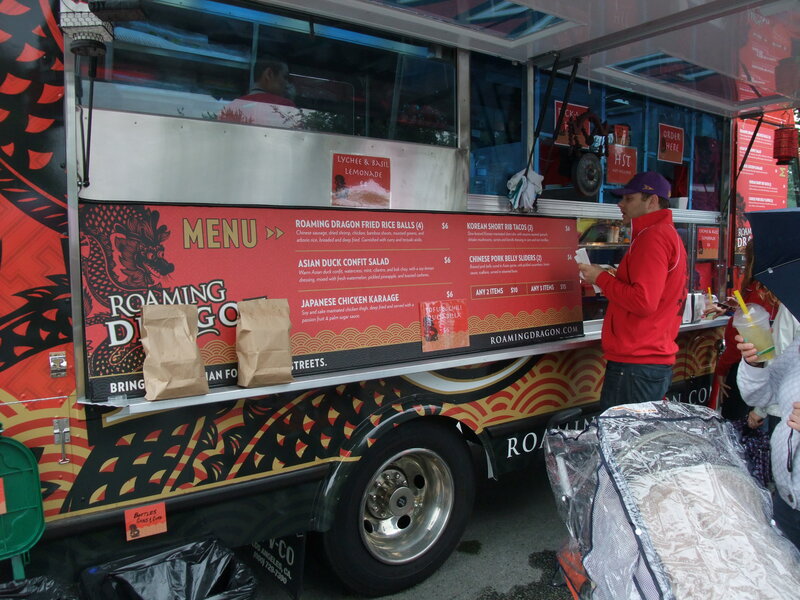 Vancouver’s first Food truck is the Roaming Dragon, serving pan asian delights out of a state of the art truck in various locations throughout the city. On Saturdays you can find them at the Trout Lake Farmers Market at John Hendry Park in East Van from 9-2 (check out their website for other locations and times http://www.roamingdragon.com/ ). The family and I headed down to East Van on the first rainy day in a month to see what the Roaming Dragon had to offer, and I am happy to say that we were not disappointed. We met Jason and the rest of the crew in their slick looking truck and placed our order, which was done on an Iphone that was synced with their POS (point of sale) system, very cool. We ordered the duck confit salad, the pork belly sliders, Korean short rib tacos, chicken karaage, rice balls and some lychee and basil lemonade. While the food was being prepared I was given a quick tour of the truck and it really is a gourmet kitchen on wheels. The food was all amazing, the duck confit salad was perfect with orange and watermelon pieces that balanced well against the salt of the duck, The pork belly sliders were on steamed Asian buns with cucumber (it might have been pickled?) and green onion and were unique (in a good way) and very tasty. The tacos were great with shredded carrots and nori which was the only thing I wasn’t a huge fan of as it took a little away from the taste of the short ribs, a very minor problem though. The chicken karaage was as good as I’ve had anywhere in the city and the rice balls were fantastic, nice and crisp on the outside and soft on the inside with a hint of cumin or something south Asian that really gave great flavor. The lemonade was the single best lemonade I have ever had, with the basil and lychee adding a grown up character to this popular street side beverage. Not only is the food amazing, it’s really affordable with most menu items priced at $4 – $6 and any 2 items for $10. All of the packaging is biodegradable, even the ones that look like Styrofoam are rice paper based. The forks are plastic though so maybe opt for the chopsticks if you’re worried about your carbon footprint, I wonder if they know about aspenware? http://aspenware.ca/ Just a suggestion. Vancouver needs more trucks like this and if the guys that run this one have their way there will be more soon as the parent company, Gourmet Syndicate ( http://gourmetsyndicate.com/ ), is set to light the Vancouver street food scene on fire. I can’t wait. For all of you “new media” lovers here’s some more places you can find them. I really wasn’t planning on writing anything today having just written about my dismal pub experience from the weekend but it seems I’m on a bit of a hot streak when it comes to being disappointed. The day started off really well, rested and refreshed from a long weekend, a little shopping at Home Depot for supplies to finish up the job I’m working on and I ran into an old friend and did a little catching up. Lunch time rolled around and it was decided that Moxie’s was going to be our lunch spot for the day. It is within walking distance from our job in Surrey and I happened to have a gift card that I wanted to use up. Sounds good right? I have alway liked Moxie’s and I’m sure I will go back because this is the first time I have really been disappointed by something I have ordered there. For instance their Kitsilano Chicken Sandwich is fantastic. My partner in elevator destruction, Jeff, swears by the Buffalo Chicken Tenders and the Blackened New York Steak is alway great. So what went wrong this time? I got a little too trusting, a bit to comfortable and maybe a little over-confident that a chain restaurant, when given the chance to create something with what seems like perfect ingredients, would actually get it right. Harsh words perhaps, but I stand by them. The target of my literary assault is the Lobster & Brie Grilled Cheese Sandwich. It sounded like it was going to be great, lobster and Brie grilled on sourdough with a spring mix salad with feta and balsamic vinaigrette dressing. I asked my server if she would recommend it and she told me she doesn’t like seafood(?) but it was a popular sandwich. Good enough for me. My sandwich arrived and I was actually a little surprised at the amount of lobster in it which should have sounded alarm bells in my head. You simply don’t get that much lobster for $13 unless it’s canned or filled with something else. The Brie still had the rind on it which isn’t a problem as it is completely edible, but I can’t help but think that most customers that would eat at Moxie’s wouldn’t be aware of this and think that the cheese was either moldy or still had the “wrapper” on it. It pays to know your customer base and I don’t think the typical Moxie’s customer is eating a lot of Brie or other gourmet cheeses on a regular basis. Back to the Lobster. This was the single most salty, fishy tasting thing I have ever eaten. I have eaten lake trout that was less fishy, I have eaten canned tuna that was less fishy and I have eaten pork rinds that were less salty. The sourdough had grilled onions “stuck” to it, for lack of a better description, that were black. I’m not sure if the lobster was canned or if it was old but it wasn’t fresh and it was over seasoned. To be blunt it was the worst lobster I have ever had. The spring mix salad was just as disappointing. It was swimming in dressing and just as salty as the lobster, so when I said that the lobster was the saltiest thing I have ever eaten I should have included this salad as its equal. It was so salty that the feta cheese in it seemed flavorless. I drank 4 glasses of water just to try to wash the salty taste out of my mouth and when I returned to work I actually felt sick, which was cured by another bottle of water. I want to finish by reiterating that I am normally a satisfied customer at Moxie’s and that I hope that this is a one time disappointment. The first place my wife and I ever went on a date was to this specific Moxie’s, the Guildford location, and it means a lot to us when we go back there. I work on a 3 strike system (unless you read my last post) and Moxie’s is 2 away from being off my list. I hope it doesn’t happen again. Southpoint Station Pub used to be a semi regular watering hole for my wife and I. Located at 3020 152 Street in Surrey (or South Surrey if you like) it opened up a few years ago and enjoyed being the new pub in a trendy, image conscious neighborhood, with full tables every night. The menu was diverse and offered some unexpected items such as Beef Wellington which was unbelievably good. Sadly this version of Southpoint Station Pub is no longer with us. When you do business in this part of town you’re only on top until the next new shiny thing opens up somewhere near by and then you’re nobody. The new shiny pub in town didn’t stop me and 2 of my boys from stopping at Southpoint for a beer and a bite after an exhilarating round of par 3 golf down the street an Meridian, one of the best par 3 courses in the city. We showed up there around 6:30pm on a Sunday and the place was a ghost town, there were 2 other tables with customers and 2 or 3 guys at the bar. Sunday usually isn’t a super busy night but seeing as Monday was a holiday I expected a few more people. The reason for this strange lack of customers would soon become very clear. We ordered a pitcher of whatever was on special, Sleeman IPA I think? 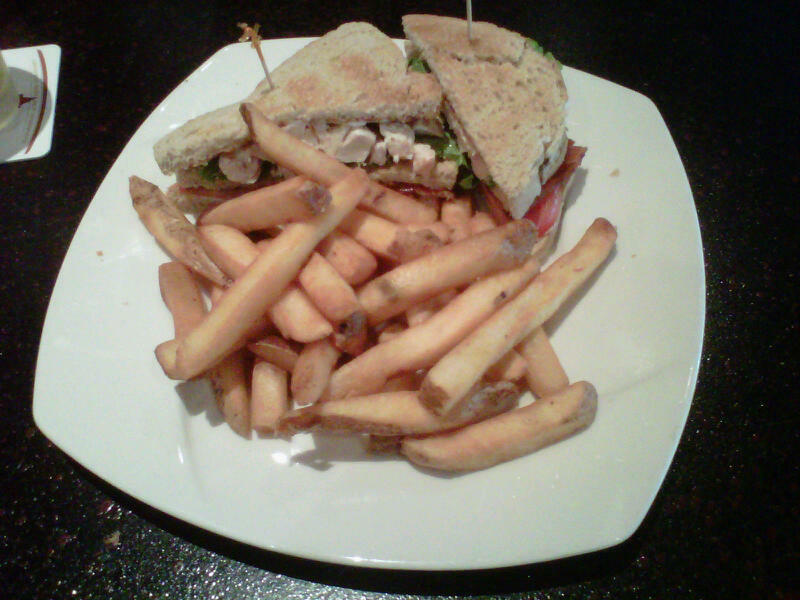 Whenever I go to a new place, especially a pub, I always order the clubhouse sandwich. If a pub can’t make a decent clubhouse I won’t go back. My sandwich arrived and I could tell just by looking at it that this would probably be my last visit to Southpoint Station. The fries were good, that’s where the positivity stops. The clubhouse was dripping with mayonnaise, the tomatoes were over ripe, the bacon was chewy and the chicken was grainy and cold. I’m pretty sure the chicken is that pre-cooked stuff you can buy at the supermarket already cubed with “grill marks” included free of charge, gross. The rye bread was not rye bread, as much as the waitress wanted me to believe it was. Very disappointing to say the least. But that’s where the night really took a turn towards the truly absurd. This next part of my story may go a long way towards clarifying the lack of customers at Southpoint Station, add it to the food and I wonder how they’re still open at all. There was a man sitting at the bar, roughly mid to late 40’s, alone, not ordering anything and chewing gum at a furious pace. He kept looking over at out table giving us the stink eye if you know what I mean. After about a half hour of this we decided to wave at him, thinking that maybe he wanted to come over and have a drink with us, which he did not. He proceeded to tell us he could “take all 3 of us” and that he wasn’t afraid of us(?). The waitress came over to apologize to us, saying he was a regular and had a bit of a temper. We asked why it seemed like he hadn’t ordered anything all night and she informed us that he hadn’t and was high on “something” which caused the afore-mentioned turbo gum chewing, you can do the math. Just when we thought it couldn’t get any worse the other 2 guys sitting at the bar hooked a Playstation 3 up to the TV behind the bar and began playing NHL 09, seriously, they started playing video games, the gum chewer included. I hope that the owners aren’t confused about why their business has declined. The gum chewer got kicked out a short time later and the bartender came over to apologize to us for his behavior and the video games but it was too little too late.